Washington is in a dither over the fiscal cliff. The cliff consists of roughly $500 billion in tax increases that will occur on January 1, 2013 as the Bush-era tax rates expire, along with almost $100 billion in automatic cuts in government spending resulting from the sequester negotiated last year in the deal that extended the tax rates through 2012. According to conventional wisdom, the resulting drop in government spending and consumer demand will shock the economy, causing it to slow or possibly fall into a recession. While Americans are right to be worried about the economic effects of the fiscal cliff, the subject of that concern should be on the production side of the economy, not the demand side—especially over the long term. Certainly, we can expect some short-term adjustments in the economy from a cut in federal spending as people leave federal jobs and projects for other work. But, as Milton Friedman pointed out in the 1960s, other things equal, a rise in revenue and drop in spending would reduce federal borrowing and free up saving for others to borrow and spend. There would be no effect on total demand unless the Federal Reserve were to slow its purchases of government debt in reaction to the fiscal shift, and that effect would be due to the change in monetary policy, not the fiscal policy by itself. The real and very dangerous effect of the fiscal cliff is what the tax rate increases would do to production over the long term. The tax hikes would slash the incentive to produce goods and services in the United States on a permanent basis (or at least until the lower tax rates were restored). Very quickly, there would be job losses. Within a few years, there would be less capital for workers to work with and thus lower productivity gains and commensurately lower wages and salaries. The fiscal cliff would raise the cost of accumulating capital as higher taxes raise the rate of pre-tax earnings (the “service price”) needed to justify acquiring the plant, equipment, or buildings being considered by investors. The higher taxes would make it less rewarding to expand factories, mines, and farms, and to build additional residential or commercial property. The tax increases would reduce the incentive to enter the work force or to work longer hours either as an employee or in running a business. Lastly, higher taxes would reduce the incentive to save, as opposed to consuming one’s income. These are the economic effects of tax policy that should be the focus of lawmakers’ attention rather than the so-called distributional tables that simply measure how the tax changes shift the burden between taxpayers of various income levels. Unfortunately, the impact of tax policy on the cost of capital, or service price, is not estimated and conveyed to the Congress by the Joint Tax Committee, the Congressional Budget Office, or the Treasury. As a result, lawmakers make tax policy in the dark, not knowing whether a provision will increase or decrease GDP, employment, and income. Consequently, in any tax reform effort or grand bargain negotiation about revenues and spending cuts, the congressional and administration bargainers have little to no idea which proposals or provisions have powerful positive effects on growth and need to be preserved, which are especially damaging to the economy and need to be avoided, and which are relatively harmless or relatively useless. This will be a major obstacle to producing a pro-growth resolution of the fiscal cliff situation. In an effort to shed some light on the situation, we have modeled the effect of most of the taxes involved in the fiscal cliff, using a neo-classical model described in the Appendix. The model produces a simulation of what the policy change would do to the economy, incomes, and tax revenues after all economic adjustments are given time to work. It does not, however, show the annual progression, year by year, from the starting point to the final outcome. The 10 percent tax bracket was eliminated, merging it with the 15 percent bracket. The 25 percent tax rate was increased to 28 percent, the 28 percent rate to 31 percent, the 33 percent rate to 36 percent, and the 35 percent rate to 39.6 percent. For comparison, the effects of raising the two top tax rates and the bottom four tax rates were run together and separately. The marriage penalty relief was canceled by reducing the income level at which the 25 percent (soon-to-be 28 percent) bracket begins for joint filers and cutting their standard deduction and the joint return threshold for the phase-out of the EITC. The upper-income phase-outs of the personal exemptions and up to 80 percent of itemized deductions were restored (the PEP and Pease provisions). The maximum tax rate on capital gains was raised from 15 percent to 20 percent for the top four income tax brackets and from 0 percent to 10 percent in the 15 percent income tax bracket. Qualified dividends, which are treated like capital gains in 2012, reverted to being taxed as ordinary income, with a top rate of 39.6 percent. The child credit was reduced from $1,000 to $500. The estate tax was increased by raising the rate structure to the pre-Bush levels, with a top rate of 55 percent (up from 35 percent in 2012) and by reducing the amount of an estate sheltered by the unified estate and gift tax credit (the “exempt amount”) from $5 million to $1 million. Two Affordable Care Act surtaxes kick in for 2013. These include the 0.9 percent surtax on HI wages (Medicare, Part A), which raises the tax rate from 2.9 percent to 3.8 percent for wage, salary, and self-employment income above $250,000 for joint filers and $200,000 for single filers, and application of the 3.8 percent HI tax rate to income from savings for taxpayers with adjusted gross incomes above $250,000 (joint) or $200,000 (single). The results of the tax model simulations reveal a number of key points. Regardless of the initial distribution of a tax change, the economic reactions to a tax reduction distribute the economic gains (or losses in the event of a tax increase) across the board. For example, increasing taxes on capital formation will hurt labor by decreasing wages and employment. On the other hand, cutting taxes on capital will increase wages and employment. Also, taxpayers need to be aware that each dollar of federal spending costs them several dollars in lost wages and income from savings due to the economic damage from the taxes imposed. In other words, federal spending costs the economy more than the numbers that appear in the federal budget. Finally, one must count revenue from all sources to determine the revenue effect of a particular tax change. For instance, higher taxes on business owners may raise revenue from them but may lower tax revenue from the people they employ whose incomes are reduced by the reduction in saving, capital formation, productivity, and employment caused by the tax increase on business income. The tax provisions of the fiscal cliff, taken as a whole, would seriously depress economic activity. As is shown in Table 1, the expiration of all of the tax provisions would lower GDP by 9.61 percent below its projected long run levels (after about ten years). Labor income would be depressed across the board by the same amount, affecting people of all income levels, in all tax brackets. The capital stock would be 23 percent below the levels it would achieve under current tax rates. On a purely static basis, the tax hike would raise $405 billion per year by the end of the period, but after accounting for the reduced economic activity, the fiscal cliff would actually raise only $11 billion. The overall result of the fiscal cliff is that it would lower GDP by $148 for every $1 of new tax revenues that it raised. * The model was run on 2008 income levels. The dollar figures were then indexed to the growth in nominal GDP from 2008 to mid-2012 to show what the equivalent values would be in the current economy. This does not account for changes in the types of incomes and capital assets since 2008, data for which will not be available from the IRS and Commerce Department for several years. ** If "N.A. ", revenues fall due to drop in GDP. Reducing the child credit had negligible economic effect; its dynamic revenue change reflects income shrinkage caused by other provisions. Below are the effects of the individual provisions that were modeled, beginning with the provisions that produced the most harm to the economy. Impact of increased rates on capital gains and dividends. The increases in the tax rates on capital gains and dividends would produce the most harmful economic consequences by far, lowering GDP by more than 6 percent over the long term. Increasing the tax rates on capital gains and dividends would restore much of the double taxation of corporate income that was removed by the 2003 tax reductions. It would account for 70 percent of the rise in the service price of capital under the fiscal cliff. On a static basis, these higher tax rates on capital income appear to raise $82 billion, but they would reduce GDP and payrolls by enough to cost the government $158 billion, after taking the economic consequences into account. Moreover, these tax rate increases on capital income would reduce labor income by more than 6 percent. The loss of pay would stem from a drop of nearly 1.2 percent in hours worked (equal to about 1.5 million full-time equivalent jobs) plus a drop in the hourly wage of about 5.3 percent for those still working. That is equivalent to a loss of about 8 million jobs at unchanged wages. In this way, the higher taxes on capital are shifted to labor. These estimates are based on the economic losses due to the tax increases only. They do not include further revenue losses likely to result as people delay the taking of capital gains (the “realization effect”) or as companies reduce their dividend payouts (which have risen sharply since the dividend tax rates were reduced in 2003). These tax increases are all pain and no gain. Impact of increased rates on estates and gifts. The rise in the estate tax is the second most economically harmful provision, in terms of the amount of lost GDP per dollar of estimated static revenue gains. On a static basis, boosting the estate tax rate is estimated to raise $33 billion per year. But after accounting for the economic effects of the tax hike, the provision actually loses the government about $18.5 billion. Thus, as a tool to finance government spending or reducing the deficit, increased estate tax rates are entirely counterproductive, costing taxpayers and the economy substantial income and harm more than whatever is recorded on the federal budget ledger. Impact of lifting marginal tax rates. The model indicates that increasing marginal income tax rates on all taxpayers would cost the economy $2.20 in lost income for every $1 of new tax revenue collected by the government, after accounting for the policy’s economic effects. Moreover, the marginal rate hikes reduce GDP and labor income by nearly 1.2 percent. Table 2 separates the economic effects of raising only the top two tax rates (the 33 and 35 percent brackets) and raising the bottom four brackets only (the 10, 15, 25, and 28 percent brackets). The model results indicate that the effects of these policy changes are somewhat disproportionate to the number of taxpayers affected. For example, while the number of taxpayers affected by boosting the top two tax rates is relatively small, the increase in their tax rates accounts for about 40 percent of the rate-related damage to GDP while raising just 23 percent of the new revenue. Moreover, boosting the top two rates lowers GDP by $3.60 for every $1 dollar of new tax revenue that is raised, while boosting the bottom four tax rates lowers GDP by $1.60 for every $1 dollar of new tax revenue that is raised. The model finds that the increase in the top rates accounts for about 74 percent of the rate-related rise in the service price of non-corporate capital due to its effect on interest and business income. That is because high income earners receive a disproportionately high share of their income from interest and non-corporate, or pass-through, business income. * The model was run on 2008 income levels. The dollar figures were then indexed to the growth in nominal GDP from 2008 to mid-2012 to show what the equivalent values would be in the current economy. This does not account for changes in the types of income and capital assets since 2008, data for which will not be available from the IRS and Commerce Department for several years. Parts may not add to total due to interactions. ** If "N.A. ", revenues fell due to drop in GDP. Impact of reversing marriage penalty provisions. The reversal of the marriage penalty relief, while not affecting the uppermost tax rates, would push many joint filers from the 15 percent bracket into the 28 percent bracket, hitting labor and capital income. 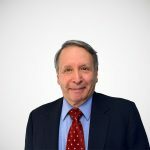 Thus it is the third most damaging in terms of lost GDP per dollar of revenue raised, causing GDP to fall by $3.80 for every dollar of additional tax revenue collected by the government—although its damage to GDP is less in total size than the effect of the rise in the marginal tax rates. The model suggests that a dollar of government spending or deficit reduction paid for in this manner actually costs Americans $4.80 ($1 in new revenue plus $3.80 in reduced GDP). That would seem like a poor return. Expensing and small business provisions. We did not include the current 50 percent expensing in the baseline for our fiscal cliff exercise because it was intended to be temporary and is scheduled to expire at the end of the year. As such, it may have resulted mainly in a shift in the timing of investment spending from 2013 to 2012, rather than generate an increase in the level of the stock of capital equipment. However, if the expensing provision were made permanent, it would be fully incorporated into the service price of capital and would have a much larger impact on the size of the permanent capital stock. The expected fall off in investment in 2013, if the provision expires, may indeed contribute to an economic slowdown in 2013. This paper, however, is concerned with the permanent, long-run depression of economic activity due to the effect of the higher tax rates on the cost of capital and the incentive to work. In particular, the increase in the top two tax rates would have a powerful negative impact on small business income and production. However, these negative effects could be moderated by extending and increasing the current expensing provisions. For example, Table 3 compares the economic effects of increasing the top two marginal tax rates alone to the same policy with 50 percent expensing and 100 percent expensing. In isolation, boosting the top two marginal tax rates leads to lower GDP. However, adding either of the expensing options lead to an increase in GDP. Adding the 50 percent expensing option would boost long-term GDP by 0.93 percent, while the 100 percent expensing option would boost GDP by 2.28 percent. Impact of the Affordable Care Act tax provisions. The ACA’s higher tax rates on capital income for taxpayers earning over $250,000 would lower GDP by 0.54 percent over the long term and labor income by a similar amount. While the provisions are estimated to increase federal tax revenues, GDP is projected to drop by $2.70 for every $1 dollar of new tax revenues, after accounting for the economic effects of the policies. Impact of reducing the value of the child tax credit. While reducing the value of the child credit to $500 from $1,000 would increase federal tax revenues, we find that this measure would have little or no impact on the economy because it has little effect on marginal effective tax rates and work incentives. Payroll taxes not modeled. We have not included the temporary payroll tax holiday in the baseline for the fiscal cliff because both parties seem to agree that the provision should be allowed to expire. The holiday reduced the payroll tax rate to 13.3 percent from 15.3 percent through the end of 2012. It is not clear how much additional employment was created by the holiday. Businesses do not like to incur the costs of hiring and training additional workers if they expect to lay them off soon due to higher costs. The projected losses in potential capital formation, GDP, and income would take time to develop to the full values shown here. The slowdown in investment and job growth would begin at once. However, it would take about 5 years to complete the full reduction in the amount of equipment required by the tax increases and about a 10 year pause in construction to “decumulate” the structures made uneconomical by the rate hikes. Property values of existing buildings would decline quickly, but the failure to construct new buildings would manifest over time. About two-thirds of the shortfall in capital formation occurs within 5 years. We might expect the tax increases to reduce the growth rate of GDP and employment by between 1 and 1.5 percent a year for the first five years and a bit less than 1 percent for the next five years. Job losses would begin quickly, beginning with a reduction in jobs and hours worked in the machine tool and construction industries. (We are already seeing a marked reduction in investment in the fourth quarter of 2012 in anticipation of higher taxes on capital formation.) After the disinvestment, job losses would continue on a permanent basis in all areas of the economy as people lose the opportunity to work with the lost machinery and industrial and agricultural structures, and lose the jobs associated with the missing commercial buildings over time. The shortfall in productivity would lower wages on a permanent basis. Initially, tax increases can generate new revenues while the revenue losses from the weaker growth take time to develop and are less visible. Conventional wisdom suggests that the increased revenues will lower the federal deficit which, in turn, will help the economy by increasing national saving. In reality, however, the higher tax rates and revenues reduce private saving and investment which, in turn, offsets any benefits to national saving from the lower deficit. The fiscal cliff is mainly a tax cliff, and its impact on the economy will mostly come from undermining production, not because it lowers consumer demand or government spending. The tax increases would simply make it harder, more expensive, and less desirable to produce goods and services in the United States. The tax increases on dividends, capital gains, estates, and to a lesser extent the increases in the marginal tax rates on other income and the repeal of the marriage penalty relief, would raise the cost of accumulating capital, reduce productivity, and cut employment and wages. Most of the expected revenues would be lost to a weaker economy and lower income. To be pro-growth, any solution to the current deficit and the fiscal cliff must rely mainly on spending reductions and must avoid raising taxes at the margin, especially on capital formation. The long run real after-tax rate of return to physical capital is virtually constant over time, implying that the supply (quantity) of capital is very responsive to changes in the rate of return. Labor’s share of factor income (and GDP) is virtually constant over the period. The supply of labor is somewhat inelastic (unresponsive) to its after-tax compensation. These three assumptions define a set of five basic equations that, when solved, describe a baseline picture of the economy at a point in time. The equations also allow changes in government taxes and spending to yield an alternative picture; that is, to estimate the effect on the economy of a change in fiscal policy. The first assumption says that real interest rates—which reflect real returns on investment in physical capital such as plant, equipment, and structures—tend to be constant when viewed over long periods. They need not be completely stationary; the assumption merely requires that deviations tend to return toward the average. Observations by economists as early as 1800 suggest this fact, as they found that interest rates in England tended toward its average. The same result appears for the U.S. over the past 60 years. Deviations tend to return to the long run average within 5 years. The mechanics are simple—deviations above the long run average imply attractive returns that encourage extra investment, which drives the returns down, and deviations below the long run average discourage investment, raising the returns over time. Looking at shares of factor income in businesses, one finds a second virtual constant. The share of factor income going to labor and capital are so constant that more sophisticated alternative explanations are statistically rejected. The implication of this observation is that output can be predicted by a simple relationship that is linear in the logs of output and factor inputs (capital and labor). Furthermore, the compensation paid labor and capital can be predicted as constant percentages of net revenues. Many have tried to estimate alternative models of production, but none have overcome the empirical fact of the constancy of the shares. Where the first assumption implies that the quantity of capital is highly responsive to its return, labor is much less responsive to changes in compensation. Dividing the labor force into primary and secondary pools reveals that the primary pool (males 15 to 64) is extremely insensitive to compensation (an elasticity of about 0.1), while the secondary pool (primarily women) is much more responsive (elasticities approaching 1). For the work force as a whole, the model assumes an elasticity of labor supply of 0.3; that is a 10 percent increase in real after-tax compensation gives rise to a 3 percent increase in labor services. The model is constructed to allow researchers easily to change this assumption to a lower or higher number as they wish. The model is constructed by separating the economy into production sectors: corporate and non-corporate private business, households and institutions, government enterprises, and general government. This aligns output according to how products are distributed and how the associated income is taxed. General government does not sell its product in the marketplace while government enterprises do. Institutions and households do not actually sell their products but can be loosely construed as indirectly doing so. All three of these sectors do have employees that pay taxes through the individual income tax. Private businesses produce the lion’s share of output. They pay taxes on their capital income, and their employees pay individual taxes. This division into four sectors provides enough detail to construct tax bases for most taxes. Each sector is constructed applying the three assumptions outlined above. This provides us with estimates of output and the compensation of capital and labor for the sector. Labor from all sectors is aggregated and the overall wage rate for labor is determined by the assumed response to changes in real after-tax compensation. One final assumption rounds out the model—that the Federal Reserve changes its policy to maintain the price level at its baseline values. This allows the model to focus on the effect of the spending or tax change rather than on some combination of fiscal policy change with an accompanying monetary change. The secondary benefit is that one does not have to adjust for price changes in determining real compensation for capital and labor. Using the structure outlined, one can calibrate the model to the chosen baseline. To test a policy change, an alternative fiscal mix of taxes and spending can be entered into the framework. The baseline after-tax rate of return on capital can then be used to calculate what the new pre-tax return must be under the new tax system to provide the same after-tax return being demanded by investors. This pre-tax rate of return on capital determines the associated pre-tax wage rate that must prevail under the existing production technology. The resulting pre-tax wage, less the taxes on labor, tells us the change in the after-tax rate of labor compensation. The assumed elasticity of labor supply then determines how much labor will be supplied in the economy. This then determines how much capital will be employed and finally what the level of output will be. Output and income are displayed in a manner that permits a calculation of the various tax bases needed to estimate taxes. One can calibrate tax revenue parameters using the baseline either to match the known revenue for a year or to match a baseline such as the CBO revenue forecast. The tax bases can then be used to calculate a detailed set of revenue accounts for federal, state, and local governments. A spending account is added to calculate deficits as well. See Tax Foundation, The Fiscal Cliff: A Primer, Tax Foundation Special Report No. 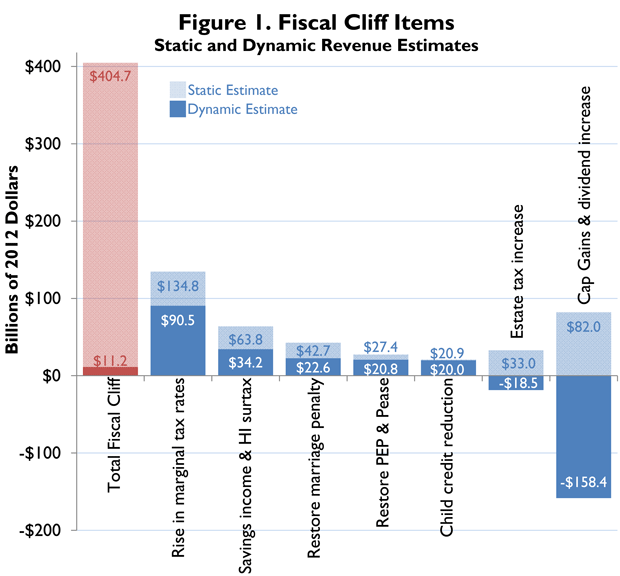 204 (Nov. 2012), https://taxfoundation.org/article/fiscal-cliff-primer. The economic model is keyed to 2008 levels of income and GDP (to utilize an actual set of tax and economic data for the baseline and to produce a picture of the likely effects once we are past the statistical distortions of the recent recession). The dollar figures were then indexed to the growth in nominal GDP from 2008 to mid-2012 to show what the equivalent values would be in the current economy. This does not account for changes in the types of incomes and capital assets since 2008, data for which will not be available from the IRS and Commerce Department for several years. The taxes were raised to pre-Bush tax cut levels consecutively, “stacked” in the order listed (each run adding a new feature to the elements in the previous run). In earlier papers, provisions were run separately from the baseline, which omits some of the interactions but ducks the question of what to model first. This method captures some of the interactions and makes the total equal the sum of the parts.